T-Drive™ III is the premier solution to drive LCD panels and displays with eDP 1.4, DisplayPort 1.4, and LVDS interfaces. T-Drive™ III provides everything to drive the LCD module, including ultra-high definition resolution, high frame rates, programmable power for panel and backlighting, SPI bus for display initialization, PWM backlight control, and EDID read/write. T-Drive™ III’s technically advanced features are enabled by our comprehensive T-Cubed™ software to create and download drive profiles and by our intuitive handheld keypad for easy operation. Once the T-Drive™ III is loaded with timing profiles, an operator may select a timing profile and turn the panel on in less than a second, scroll through test patterns, adjust pattern attributes in real-time, and much more. The standard T-Drive™ III includes eDP/DisplayPort output, multiple built-in test patterns, and the ability to display downloaded images. T-Drive III has four video output card slots. This gives you the ability to populate the tester with the needed outputs. The standard tester comes with one eDP/DisplayPort output card. To achieve higher resolutions or refresh rates, simply install a second output card into one of the open slots. For example, to test a 4Kx2K eDP panel at 120 Hz, two eDP/DisplayPort output cards are needed. 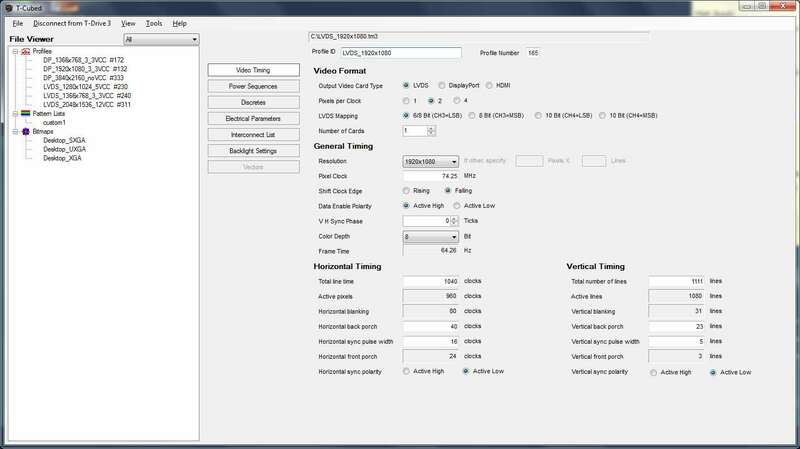 T- Drive III generates many enhanced test patterns and supports real-time adjustments for color, intensity, position and size. Custom patterns may be downloaded and stored in the tester for display on your LCD. The system comes standard with the eDP/DisplayPort output card and bitmap capability. Other options are available such as the Quad LVDS output card and Windows DLL for remote control. Check out our LCD Tester Options or Contact Us for info on T-Drive options and accessories. If you can’t find what you are looking for, contact us for info on T-Drive options and accessories. 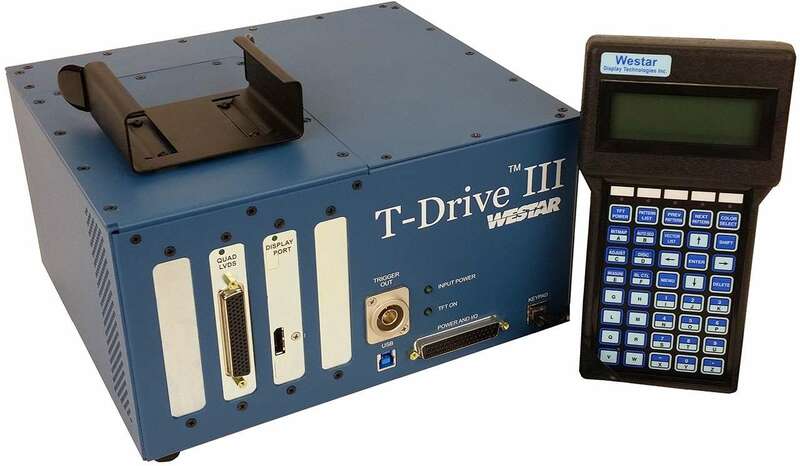 Westar’s family of LCD Testers are supported by our Tooling Solutions. A tooling solution allows you, the customer, to use our LCD Tester to test a particular display. Tooling solutions are developed cost-effectively by our support staff, saving you time and money for your test functions. For quickest delivery of tooling solutions, we ask that you supply a sample display, along with its specification or datasheet. Our tooling specialists will use this information to create a tooling solution. We have already developed hundreds of tooling solutions for many common LCD panels. Just ask our support staff if we have a solution already complete! Our cabling solutions are delivered with schematics to allow you to repair your cables, or build more yourself. Our profiles are ready-to-use on your TFT Tester, already tested at our facility!